Franklin Mills Company offers the most unique, adjustable weapons storage systems available on the market today. 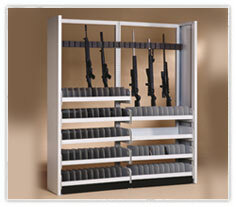 Our weapon storage solutions are available in secure (locking) or as non-secure shelving formats. Our adjustable accessories allow end users to reconfigure systems in seconds and store weapons with scopes and optics attached to the weapon. Our systems are designed for vertically, horizontally or mobile storage of any size rifle, shotgun, handgun or personal defense weapon. Franklin Mills weapon storage systems are available as stand-alone fixed storage systems or as high density storage systems mounted to moveable carriages for a compact shelving system. Our experience in storage systems will ensure implementation of the most efficient, affordable and space effective armory for your particular needs. When you need to safely and securely store your weapons, Franklin Mills has the solution. Our weapon storage solutions are flexible and have been configured to store virtually any firearm including systems for M-16, M-4, M-9s, Remington & Mossberg shotguns, M-240s, M-249 and M-2s. All of the accessories for rifle storage, hand gun storage, small arms, ammunition, parts, supplies and gun cases can be reconfigured at a moments notice. All of our systems are designed to make a difference when it really matters. Please contact us directly at 1-888-678-4585 for personal assistance in determining the best storage system for safely managing your weapons.